Deliver the highest degree of customer satisfaction through superior workmanship and service. Provide only clear and accurate estimates. 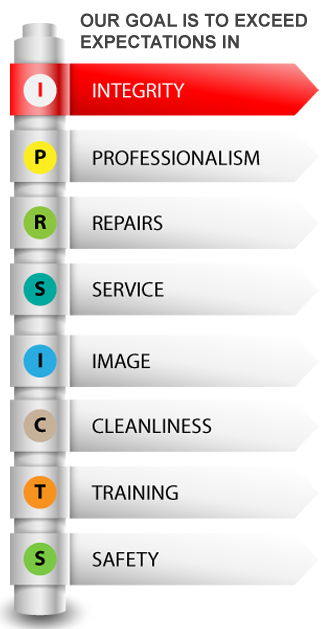 Be professional and objective in all our evaluations, insisting only on proper repairs. Adhere to our written estimates and to those of insurance companies, and execute all repairs correctly the first time. Obtain approval from customers and insurance companies prior to proceeding with any additional repair work not previously authorized. Use only the most suitable parts and materials, obtained from reputable suppliers. Offer and encourage ongoing training for all our employees in order to ensure the highest level of workmanship and expertise. Provide a clean and safe work environment in accordance with the law and the high standards within Fundy Collision Experts. Fully adhere to applicable legislation. Make customers concerns ours and eliminate those concerns through second to none quality repairs.